While South Koreans drink as frequently as they used to, the average volume of alcohol consumed on each occasion has dropped consistently, a survey showed. The survey of 2,000 adults conducted jointly last year by the Food Ministry and Korea Agro-Fisheries & Food Trade Corporation showed that consumers of alcoholic beverages drank an average of 8.8 days per month. Frequency of drinking was the same as the previous year. 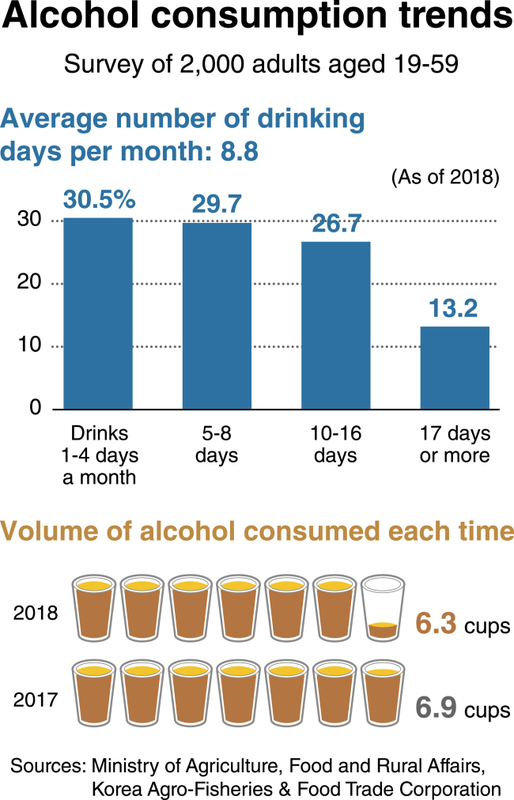 Respondents said they drank 6.3 cups of alcohol on each occasion, down from 6.9 cups in 2017. The average volume of alcohol consumed at one time has continued to drop over the years, having stood at 8.3 cups in 2014, 8.2 cups in 2015 and 7.9 cups in 2016. Some 40 percent of respondents said they drank beer, followed by 31.3 percent who drank soju, 19.2 percent traditional alcoholic beverages and 3.2 percent wine or imported liquor.